The Tula Picnic Bench is available in mild steel and stainless steel and blends seamlessly into the surrounding environment. 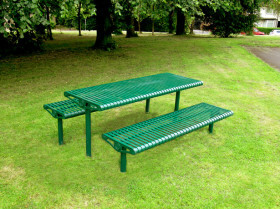 Perfect for parks, playgrounds, pubs and other leisure facilities, the attractive picnic bench allows for increased usage of the open public space, creating a warm and inviting social area. Inspired by the strength and rigidity of 21st-century airframe construction, the Tula picnic bench is engineered to endure all weather conditions whilst providing excellent support. It is also available in bespoke heights to create a unique standing table for outdoor eating areas.